nsyilxcən is the language spoken by and distinguishes the Syilx/Okanagan from other indigenous peoples. It is part of the Salish language family which is distinct from our Salish neighbors, like the Spokan, the Nlaka’pamux, and the Secwepemc. nsyilxcən is spoken in all the districts of the Syilx/Okanagan territory with varying dialects. As part of colonization Indian Residential Schools were introduced and Indigenous Peoples were severely punished for speaking our own languages and forced to speak English, resulting in a severe loss of the language retention in our communities. 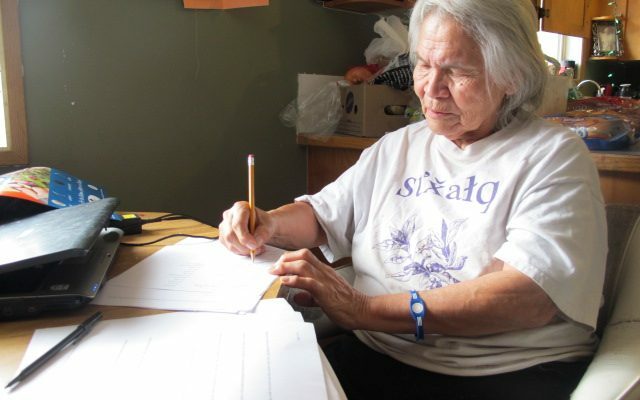 Today, community based language revitalization strategies such as immersion schools, language nests, developing curriculum, web based tools and books are all making language a major component of educational curriculum. The ONA CEC is committed to the preservation and practice of Syilx/Okanagan language and culture. Through numerous nation-wide initiatives the ONA has supported, assisted and promoted the development of nsyilxcən language and culture resources through our partnerships with En’owkin Centre, Paul Creek Language Association and the Interior Salish Language Associations. This work is guided by the Elders and Speakers throughout the Okanagan Nation communities. Currently, William (Bill) Cohen is our ONA representative on the First Peoples Language and Culture Council (FPHLCC) BoD – a Provincial organization mandated to support First Nation languages, arts and culture.